T H U M B S U P ! There is no end to books about one�s career, management, and sales. Among the latest to arrive is WIN Without Competing! by Arlene R. Barro, PhD ($17.95, Capital Books, Inc., softcover). 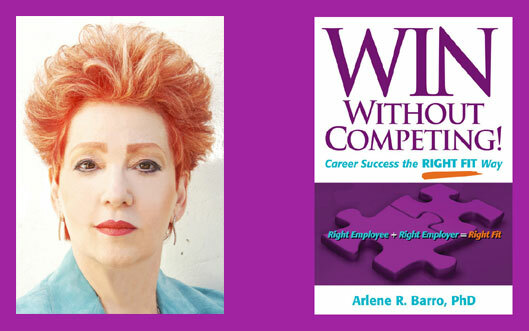 Dr. Barro has spent a decade matching people with jobs and she shares her knowledge with new graduates, back-to-work job seekers, and anyone looking to move up the ladder. This is more than just a how-to book, but how the reader can get into the head of human relations types while you learn the skills necessary to determine your own goals.
. . . an easy to read, well organized �Drama in Four Acts� that provides a wonderful way to look at your professional (and personal) life. . . . I believe that Dr. Barro has crafted a book that clearly explains her process, provides inspirational examples and many excellent tools. Self analysis checklists, journals and worksheets can help a reader instantly start the Right Fit Method. �reviewed by George F. Marron, PhD. School of Management, Marist College. The Business Journal of Hispanic Research, December 2007, pages 122-123.